Welcome to March! A new month brings with it a new list of what's in season. 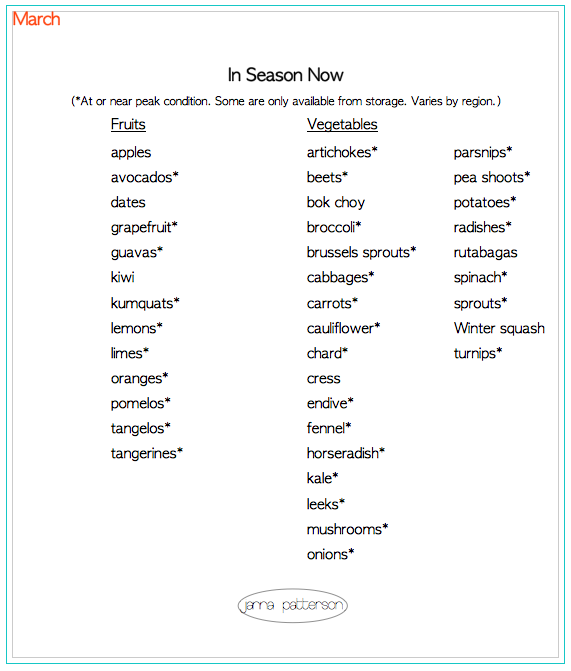 Again, these lists that I give you include the most popular fruits and vegetables that are in season across the U.S. For what's in season in your specific area, check out this AWESOME, oh, so easy-to-use map by the folks over at Epicurious! While we're browsing through all these nutritious bites, I want to mention that I was recently asked by our friends Josh & Katie Hupp to be a guest at their budding new blog "Healthy. Lifestyle. Change." HLC is dedicated to offering small tips to help people take control of their health and improve their life. You may not know it by some of the recipes I post here, but I'm a big ol' nutrition nerd and have been since I was in my teens. So, they asked me to write a bit about knowing how to select nutritious foods without being a food scientist. If you want my 10 Tips, click here!